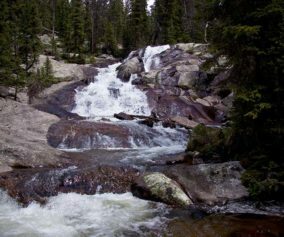 Adams Falls is a short .6 mile round-trip hike near Grand Lake, Colorado. 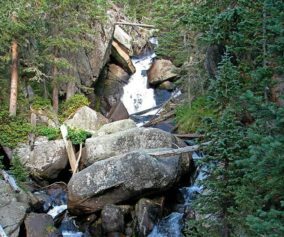 The waterfall borders Rocky Mountain National Park and its trail begins at the same trailhead for the East Inlet Trail. 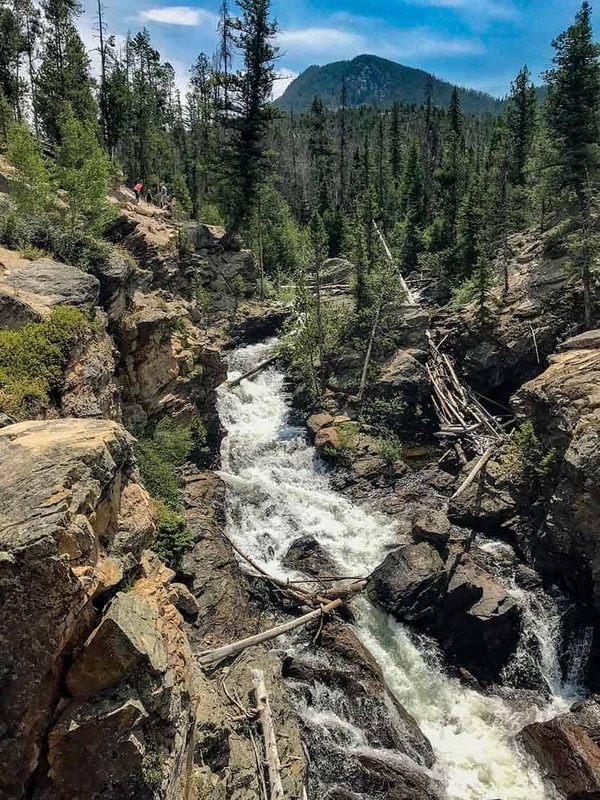 Explore the full Adams Falls hike profile below for trail map, driving directions, and all the details you need for this short waterfall Hike in Rocky Mountain National Park. 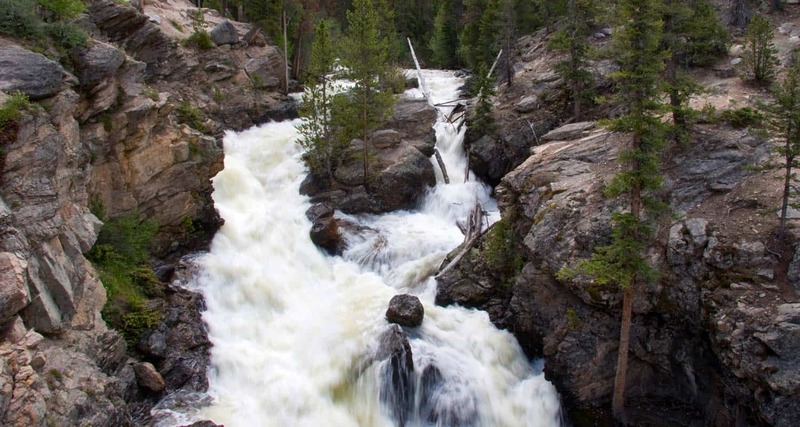 Adams Falls is named after Jay E. Adams, an early settler of Grand Lake, Colorado. 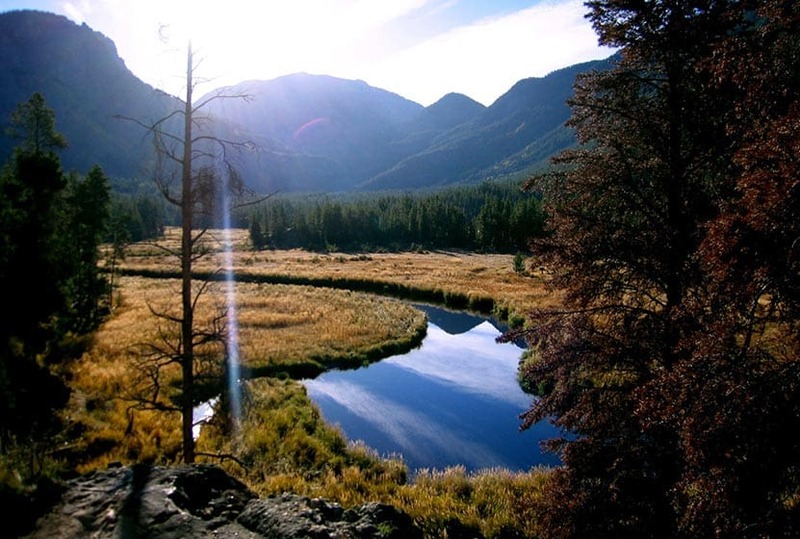 This hike is on the quieter western side of Rocky Mountain National Park. However, it’s still a popular trail, so expect to encounter a lot of hikers. Go on a weekday or early morning for the experience of quiet and solitude. After hiking the .3 mile segment of trail, you’ll arrive at Adams Falls. There is an observation area that grants the best and safest views of the falls. 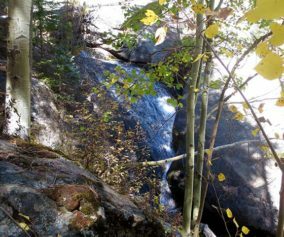 The hike to Adams Falls is perfect for families with young children who may not be able to hike as far. As with all streams and waterfalls, have children exercise caution. Rocks are slippery and the hydraulic force of the creek can be incredibly powerful. 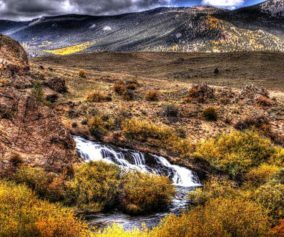 About 1/4 mile beyond Adams Falls, there are spectacular views of the East Meadows, making the short distance a worth addition to this easy waterfall hike. Wear Good Footwear: The trail has a lot of rocks and roots, so be sure to have shoes or boots that can handle slick surfaces. Explore More: Hike about a quarter mile past the falls to where the meadows open up and East Inlet creek meanders through the tall grass. It’s an amazing sight. Photo: We would like to express our gratitude to Kimon Berlin for sharing such an amazing photograph of this hike.